The smallest country in the world with less than one thousand permanent residents, there are still plenty of reasons to visit the Vatican City. 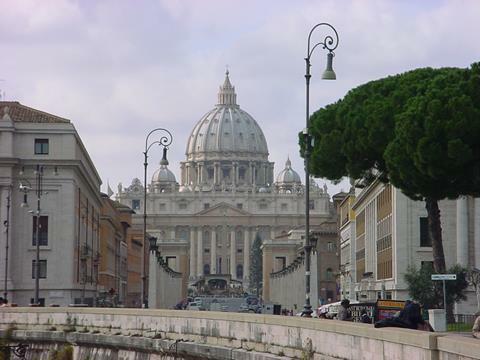 It is the home of the Pope (the head of state) and is the centre of the Catholic world, completely surrounded by the city of Rome. 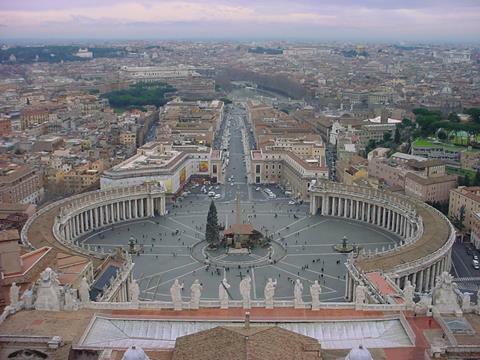 Interestingly, due to the small number of residents and huge numbers of visiting tourists the Vatican City has the highest crime rate per capita of any country in the world. But don't worry - you'll feel perfectly safe! 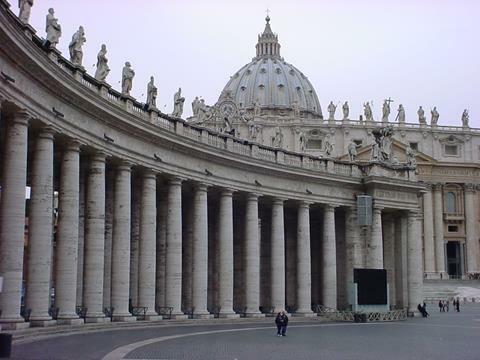 My first trip to the Vatican city was during our trip to Rome in Jan 2005, when the queues were seriously reduced and there wasn't the risk of collapsing with heat exhaustion whilst waiting at the metal detectors. Most disappointingly however, I didn't get my passport stamped. We saw St Peter's Basilica inside and out, the Vatican museums and the Sistine Chapel, but the undoubted highlight, hands down, was seeing the Pope! The view from the top of St Peter's Basilica over the square and collonade at the front. In the middle of the Piazza San Pietro there is still a nativity scene in place. Looking back along the road from the River Tiber to St Peter's Square, the previous photo was taken from the small collonade at the very top of Michelangelo's dome. The spire on top of the dome reaches nearly 138 metres, and it is a double walled structure which makes for some interesting clambering up inside between the dome walls. The collonade on St Peter's Square with Michelangelo's dome in the background. Michelangelo also built the collonade, with stone pinched from the seating of the colosseum, which nobody was interested in preserving five hundred years ago owing to its pagan nature. There is a point marked in the square where you can stand so that you see the illusion of only one row of columns, not four. 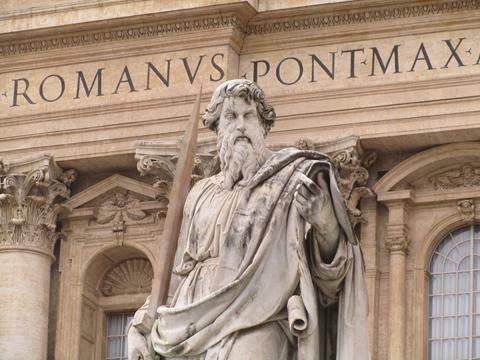 A large statue appears to stand guard in front of St Peter's Basilica facade. These are two of the Swiss guards, who you'll spot wandering the Vatican in their somewhat jester-ified outfits and sporting pikes. 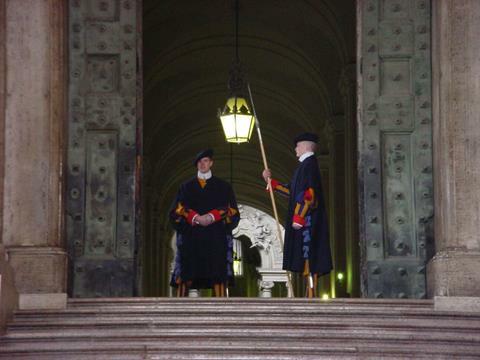 They are the Pope's personal army, and comprise a large proportion of the Vatican's permanent residents. Each guard is well trained in use of the pike, and if you want to join you had better be from Switzerland. Within the vast interior, the bronze baldacchino and the altar can be seen in the distance. 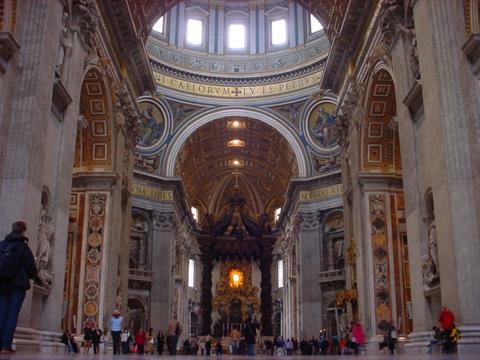 It should be noted that St Peter's is not the largest cathedral in the world, as a basilica is a separate classification which outranks a cathedral. The interior is lavishly decorated with paintings, statues and mosaics. 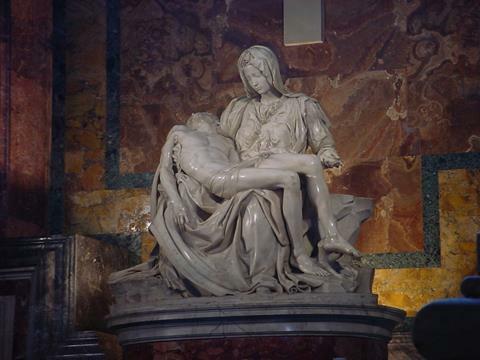 Michelangelo's "Pieta" depicts in marble Mary and the body of Jesus after being taken down from the cross. It is behind bullet proof glass now after being attacked by a lunatic some years ago. Michelangelo signed his name on Mary's sash after being offended by an onlooker who didn't know it was he that had created the sculpture. 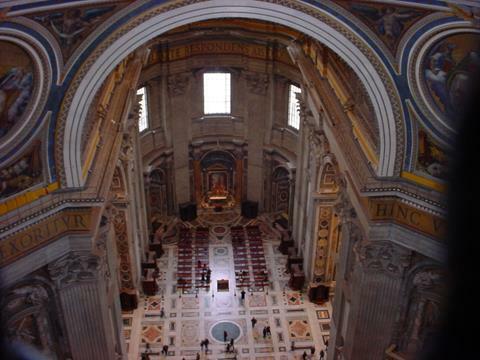 A view down inside the basilica from the inner rim of the dome, high above the ant-like people below. I got a much better idea of the scale of the place standing up here, it is one of very few buildings I have been to of truly "Star Wars" proportions. This shot is looking into one of the transepts. 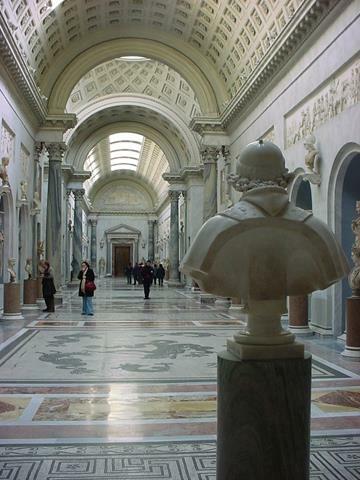 Another of the display corridors of the Vatican museum, this one was particularly tranquil with busts of Roman figures. 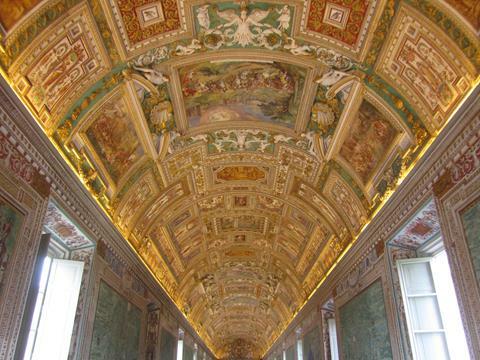 Inside the Vatican Museum there are miles of ornately decorated hallways to explore. It wasn't until my second visit that I appreciated quite how good it was to wander around without the crowds of the tourist season. 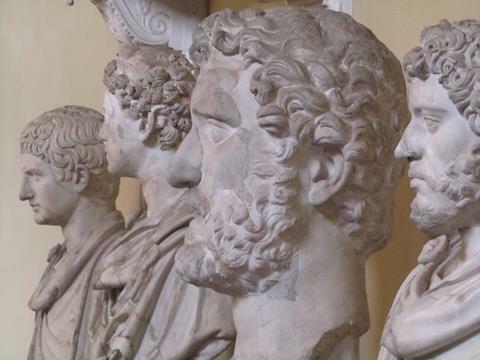 A selection of busts of various prominent Roman figures, in the 3D section of the museum. The Raphael Rooms for some reason I missed on my first visit to the Vatican Museum, however I was really pleased to get a look in the second time around, especially at this fresco "The School of Athens". 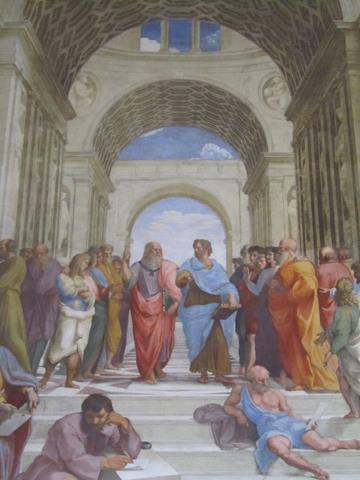 They really had education figured out back then, spending all day lounging around in togas. 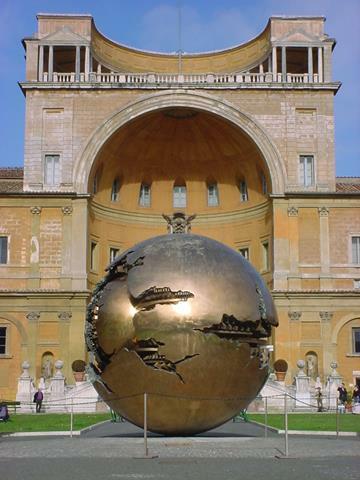 My first thought on seeing Arnaldo Pomodoro's "Sphere within Sphere" in one of the Vatican Museum gardens was that it was the damaged sculpture which used to sit at the base of the World Trade Center in New York. It is in fact one of a series, with others to be found in Dublin and San Francisco, and takes the form of a collision of a small ball into a larger one. I tried to make it look as if it had slipped down from the alcove in the building behind. 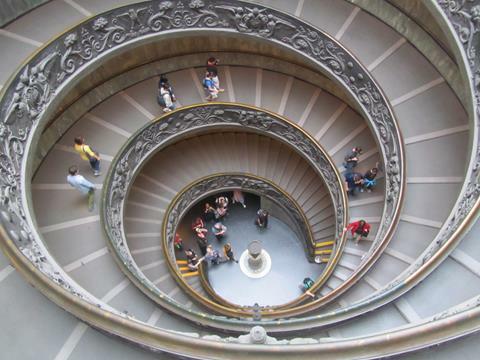 The spiral stairs on the way out of the museum feature heavily in postcards of the Vatican. I would perhaps have added a picture of the roof of the Sistine Chapel on this page too, but they don't allow you to take photos of it and I respect that. If you want to see it, go for yourself! Here he is! 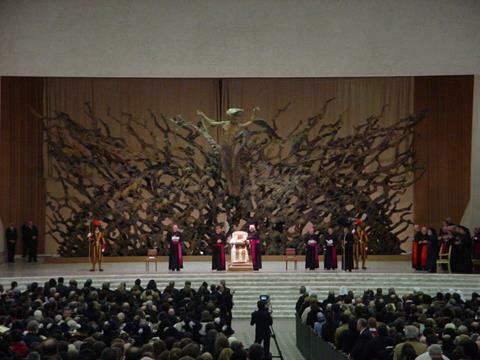 Pope John Paul II, in what was probably one of his last public audiences in late January 2005. It was free to attend, provided you got there early enough to get tickets. There was great excitement before he came on, and the event lasted about an hour during which time he addressed the audience in six languages, welcoming individually each registered visiting group.